It's early and we're all in Salford, Manchester, at Media City so Martha and I can go on BBC Breakfast News to talk about our experiences and new book that launches today. 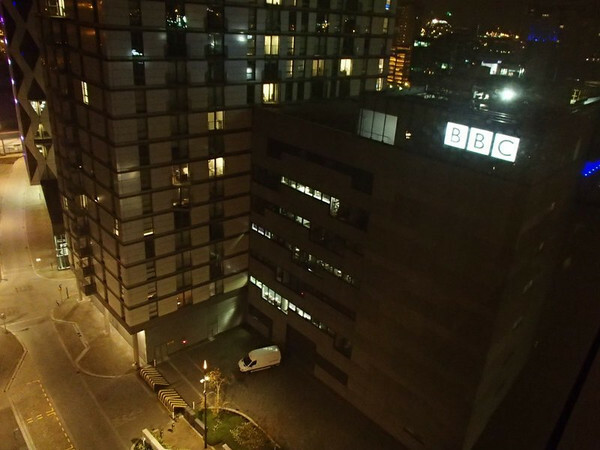 Media City is an amazing place and seems never to sleep. We got our hands on our book yesterday and its fabulous. It looks beautiful and is full of colour photos and it has a lovely feel and weight in the hand. A certain VEG couldn't put it down! Once we've chatted with Louise and Charlie on the breakfast sofa we're meeting up with Helen from Blue Peter and Barney the dog before heading north to Glasgow for some more interviews, a trip to the STV news studio and then the official launch where we get to catch up with all our friends and supporters and say our thanks to you. 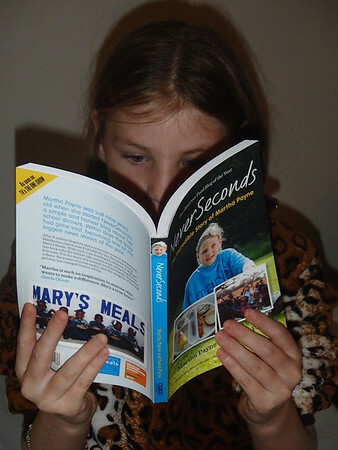 If we sell 1000 copies of our book that will be 25,000 Mary's Meals in Malawi. Imagine if we sell 5000 or even 10,000 copies. Who knows? Saw you and your dad on BBC this morning, well done! :) You were both great and hope your writing career continues. Thanks Dave. What an adventure! As promised earler, we just ordered 6 copies to give as Christmas presents. I hope all goes well today, as I am sure it will. A big let down by Waterstone's. I have visited several of their bookshops. Not only do they not have NeverSeconds, with no plans to order, they do not even have a clue what I am talking about. How can what is jokingly called a bookshop chain, not know about a book that has been serialised in the Sunday Times and had loads of media attention? I suggest everyone reading this in the UK, goes into Waterstone's, asks for NeverSeconds, when told not in stock, never heard of it, express their amazement. I've already ordered mine - but it may take awhile to get from the UK to the States....SO excited for you. Just got an email from Amazon saying my book has been dispatched! I will check out a few bookshops in London and report back on the situation. The book will be available only in US? I'm from Brazil and would love to buy and read the book, and by doing that support Mary's Meals. Congrats to Veg and you Dave, for doing this amazing job! You can buy from amazon.com.uk and they will ship the book to Brazil for you, or buy the kindle version. Sabrina, you can buy it at amazon.co.uk and they will ship it to you in Brazil. We are what we eat, ours kids are what they eat, our diets can have a positive impact on some of the most serious diseases today (cardiovascular diseases, diabetes). So, as a father of two and a food chemist, I think that your story will be so interesting for all of us. Good Luck to your book and may be the catalyst for more nutritious food for all of us! I tried again today to find NeverSeconds. Hopeless. Waterstone's looked at me blankly. When checked on the system, one copy ordered, no idea when will be in. Unbelievable, a book serialised in the Sunday Times, loads of media publicity, and yet in waterstone's they have not a clue what I am talking about, only one copy on order!